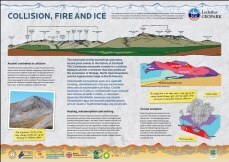 Lochaber Geopark is holding a public exhibition of 20 new geological interpretation panels installed during 2011-12 in Lochaber. The panels are located at scenically spectacular viewpoints throughout Lochaber. The free exhibition runs from Monday 3rd September until Saturday 15th September (not Sunday 9th) in the Ben Nevis Distillery Visitor Centre, Fort William, and will be formally opened by Charles Kennedy MP at 14:30 on 3rd September.